Images Not Loading - Gremlins, Again? And me has the same problem too, when is BOB going to fix this? This seems to be a Windows 8 issue, the tech guys are looking into it to try get a fix. Can you guys please post some more specifics about the issue. If you can just post the image name, we will be able to look at log files and see what the issue is. Sorry Mac...Ruthie sent images, I did not save any...but my systems are fine now. Still a tad slow, but loading. May be weather related this side. Storms pounding some areas and we are in for a 'doozy' later this afternoon into the wee-wee hours of tomorrow morning....damaging winds, tornados and flood threats. Gonna be a loooooong night 'hiding out' in the storm shelter. our engineers have been touch with users having submitted tickets regarding uploads and during many of those calls we so far found that the issues are related to unstable internet connections (massive amounts of packet loss), damaged ADSL lines or various PC issues. We are ruling out bugs and looking at our server logs we can see that clients disconnect after a few minutes. We don't have any upstream (throughput issues) at the time. It also does not look like a wide-spread issue, as image uploads are performing well (obviously not well for users affected). If you struggle, please submit a ticket and we will try and assist as much as is possible over the phone. Unfortunately the issue seems to be in all instances sofar on the client side - it would have been much better if the issue was on our end as it could have been easily fixed by now. Again.... since 1800-hours Friday night. Have deleted cookies, run scan, rebooted. Called ISP Provider... nothing wrong this side. Was 'slower than snot'.... after first post/reply, but at least loading. Now, back to 'sit 'n spin'. Same problem here. We weren't able to upload images since Friday19th April. On Saturday we could upload 1 listing only, because the images were already in the image gallery. Also can't add to the Image Gallery. We have tried 3 different browsers and have cleared the cache, but no luck. Error message on main picture is "Processing of multipart/form-data request failed. Socket read failed". 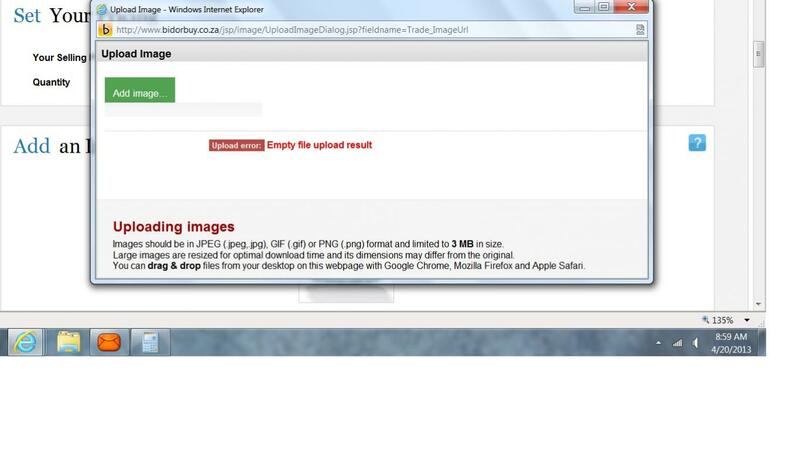 Error message on thumbnail upload is "Upload error: true". Uploading to eBay is working fine. we have received a number of tickets regarding this issue and we acknowledge that upload issues have increased. Our engineers will get hold of people who submitted tickets and we will ask customers to assist us with network traces and upload tests to try and isolate the cause of the problem. From our tests, it does not appear to be an internal issue (i.e. our servers or application stack) and we have broadened now the search to ISP level (i.e. issues with core switches or network infrastructure at our hosting facility). The problem isolation is difficult as we are unable to reproduce on a number of test-lines and our private test-lines (we have tested a broad spectrum of ADSL service providers and 3G services). Workaround: If you struggle to upload images to our servers, you can still reference images from other online image services (such as Flickr or Picasa) and then just paste the URL into our thumbnail link. Although it is not ideal (as images will then be served from overseas), it will at least "bandaid" the current issue we are experiencing. I have also been having issues uploading pictures - Windows 8, 2mb line but I don't think it is a Bidorbuy issue. There seems to be stability issues with MWEB, everything goes fine then for some reason there is patches where the connection becomes really sluggish and times out when uploading pictures or opening webpages. Everything is fine today but there was issues over the weekend. We are still puzzled by this. Some users seem to have it all the time, while others experience it infrequently. It's certainly not easy to determine where the root cause lies, as each user has a different setup and we have not established a common cause. We have a number of tasks planned during our maintenance window tomorrow morning to test some scenarios and remove some possibilities. Hi there - some update: We removed a security device which we believe might have interfered with some users. One or two users we phoned reported now no problem, but I do believe that the removal of the device has not necessarily resolved the issue. If you had upload problems in the past, could you please retry and post your results in this thread. Please also include: (1) Your internet connection, (2) Browser/OS used, (3) Name of image you tried to upload (so that we can look at log-files). Thank you for your post TGSA. Please try clear the cache on your browser, if this does not work, let us know, and one of the IT team will contact you tomorrow to discuss your issues. As you can see from the response above from Gerd, this is not affecting many users, so if it was a general problem affecting all users of the site then I would say that there is an issue or bug on our side, but this is not the case. We have in fact spoken to quite a few users regarding their issues and have assisted them, since then these users have confirmed that all is working again. This could be caused by operating system, browser or internet connectivity issues on your side, none of which we can easily replicate or see from our side. We do care about the issue and have contacted many of the users who have complained, however, you sent in multiple new tickets yesterday, it goes into a ticketing system queue and will be responded to in due course (we endeavour to respond within 2 working days to tickets due to the volume of email we receive). I would have responded sooner to your ticket if you responded on the same ticket number but you created new tickets which would not have been assigned to me, thus your new tickets would have been put in the queue to be answered when the first available staff member was assigned to it, thus creating further delays in assisting you and multiple staff members all dealing with the same issue. with the removal of the security device on the 22nd April the reported upload issues disappear. We can confidently say that the security device caused the upload issues.